Irish shot glass set features a himself and a herself glass that are both enhanced with shamrocks. Himself and Herself are the king and queen of the castle. These Irish shot glasses, with green shamrocks, feature one that says himself and one that says herself. The shamrock shot glasses measure 2 1/4" tall and hold 2 ounces of whiskey. 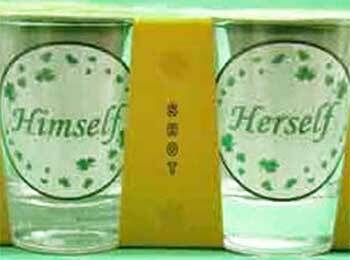 The herself and himself shot glass set is made in Ireland by Liffey Artefacts and are gift boxed with a shamrock history card, complements of The Irish Gift House.